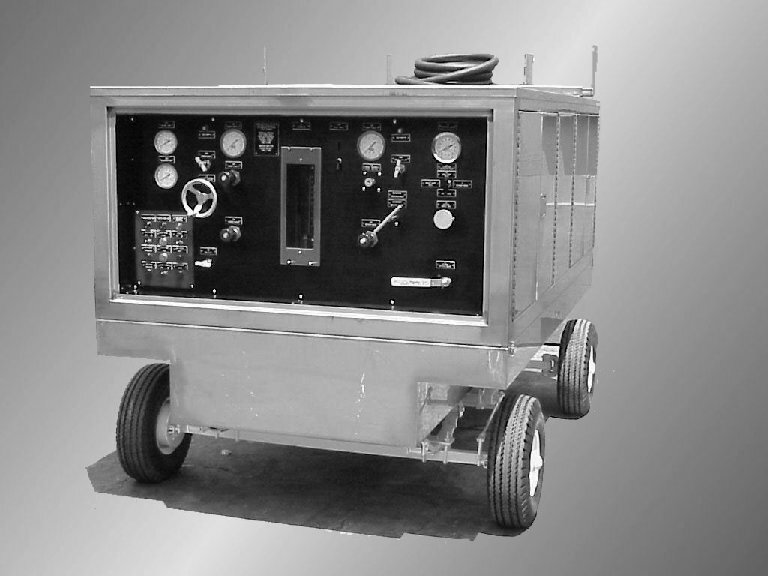 0-55 GPM, 3000 PSI dual system portable aircraft ground support test stand capable of 5000 PSI intermittent duty. The system is designed for low maintenance and flow operation of the narrow and wide body aircraft. The flow and the pressure are adjustable at the control panel. A single adjustable back pressure regulating circuit allows the operator to adjust aircraft reservoir return condition and maintains a positive reservoir head pressure on the aircraft without fluid loss. This feature allows the system to be used on various aircraft with different reservoir pressure requirements. All controls and instrumentation are mounted on a common control panel for your operators convenience. The control panel is also lighted for night use. This feature illuminates the control panel for easier operation in poorly lighted areas and for night operation. The model HPPE503K-S4/60 unit is designated "The Quiet One", and with good reason. We have exceeded OSHA noise level guidelines well below the 85 DB Maximum established. Our system design, component arrangement, and manufacturing assembly technique affords consistent readings at 79 DB or less. The A-L-S unit is offered with our unique AUTOMATIC AIR BLEED DEVICE, exclusive to our unit. This feature eliminates the need for ground personnel to manually bleed air. This device automatically removes air in the return lines that connects to the aircraft test panel. It assists in removing air trapped in the aircraft and the return lines for C & D test condition on both open and closed loop operations. This feature helps to quiet the unit and gives the user longer pump life. (See technical data sheet #ALS 1328). The HPPE503K-S4/60 unit is towable to 20 MPH with a steering radius of 25 degrees and mounted on 4 pneumatic tires size 600-9, 6 ply. The chassis has a 2 wheel mechanical parking brake. The lower portion of the chassis serves as a full sized drain pan with drain valve.